At 11.09pm last night, 23 Labour MPs, including Poplar and Limehouse’s Jim Fitzpatrick, were sent the below email by that well known branch of the Unite union, the Retired Members’ Association (Colchester and District). Dan Jarvis, Wayne David, Jim Dowd, Angela Eagle, Maria Eagle, Emma Reynolds, Frank Field, George Howarth, Gloria de Piero, Graham Jones, Harriet Harman, Heidi Alexander, Margaret Hodge, Holly Lynch, Tom Blenkinsop, Jenny Chapman, Joan Ryan, Alan Johnson, John Spellar, John Woodcock, Helen Jones, and Kevan Jones. They all voted with the Government to launch airstrikes against ISIS in Syria. We believe it is high time to remind you that Jeremy Corbyn was democratically elected Labour leader with almost 60% majority, the highest ever recorded for a leadership contest. While we understand that some of you will have been disappointed at the final result, we would expect that all of you should have the grace to accept that this was clearly a demand for a change of policy direction towards the desires and aspirations of the overall majority of working people. We have to say that we find it distasteful that some of you indulged in, what can only be described as a ‘Judas’ congratulations to Jeremy when his overwhelming victory was announced. Subsequent actions and statements and involvement of the media by some of you, indicate that even during the election campaign, steps were already afoot to undermine him. It is our view that those of you engaged in disruptive tactics would be better engaged in analysing why such a huge majority have chosen Jeremy as the new Labour leader and that his success has resulted in a three fold increase in membership of the party in contrast to the 5 million votes lost by the previous Labour administration. It might be pertinent to remind you that New Labour in office was the first Labour government in our history to preside over the gap between the rich and poor increasing, leaving illegal anti union laws on the statute book placed there by the Tories in violation ILO standards, extending privatisation rather than advance the public sector and, most shocking of all, abandoning the principles of peace and international law and lining up with a reckless, aggressive reactionary US administration. Clearly the majority of the membership believe it is time to reclaim our party for the values of working men and women, the values of socialism. Clearly supporting the Tories to unlawfully bomb Syria indicates that you have learnt nothing. Did you feel comfortable going into the voting lobby with the Tories whose leader has, in effect, insulted millions of British people who have doubts about the bombing by implying that they are supporters of terrorism? It is becoming abundantly clear that the idea that air-strikes will destroy ISIS while they are selling to oil to Turkey and are funded by Saudi Arabia and Qatar is ludicrous, and to exploit the memory of those who gave their lives to fight fascism in Spain and in WW2 is a misinterpretation of both events and an insult to those involved in both conflicts. As veterans of the recent conflicts have stated ‘these invasions, occupations and attacks have caused great devastation, killed hundreds of thousands of people and have led to the destruction of societies’. This irresponsible action has now placed Britain to the fore front and rather that make our country safe has exposed the British people as principle targets for the terrorists. With the rampant behaviour of some of you, we can be forgiven for concluding that maybe it’s not ISIS or Assad that you are interested to remove but Jeremy Corbyn whose success, you feel, is a threat to your careers as politicians and to the privileges you enjoy as members of the ‘parliamentary club’. While we are not in favour of ‘bullying’, it should not surprise anyone that those of you in the fore front of disruptive behaviour should be the recipients of severe and emotional criticism. As for those of you who excuse yourselves for voting on the basis of conscience, we wish to make it clear to you that selection for MPs cannot be based on individual conscience but on strict loyal support for party policy as determined democratically by the majority of the membership. As for the question of selection or deselection, that is a matter for CLPs to choose who is best suited to campaign for the aims of the party as a whole. Our message to you all is to desist from any further divisive actions or statements and to unite behind our new leader and concentrate on getting rid of the Tories once and for all and establish a Labour government dedicated to achieve a socialist alternative to the present decadent society. As far as the remit of this blog goes, Jim’s constituency party backed Yvette Cooper for the leadership, while Jim doesn’t have to worry about deselection as he’s retiring at the end of this Parliamentary term. Here’s a scan of the full letter, and in pdf here: Letter to Labour MPs1. The final push: has anything changed? A day to go and even Radio 4’s Today programme has got in on the act, having just given the Tower Hamlets election its second prime time slot just before the 8pm news. 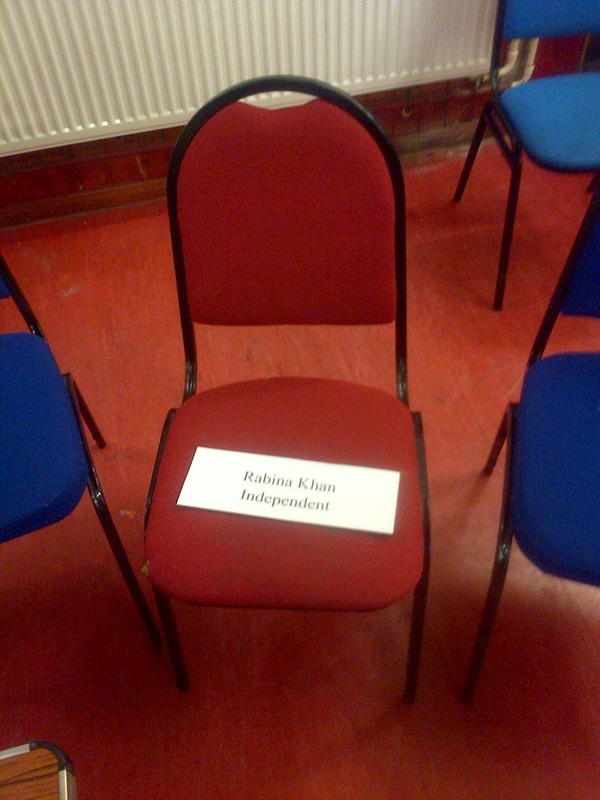 The tenor of her report was plus ca change: John Biggs facing false allegations on the doorstep that he will close down mosques; accusations by Andy Erlam of possible vote fraud; returning officer John Williams again telling the world we can be confident in the process; Rabina Khan, who has promised to be more transparent than Lutfur, refusing to be interviewed; and every single Bangladeshi voter in the vox pop asserting that Lutfur had been stitched up and that he hadn’t been corruptly elected. I’m sure Richard Mawrey QC would have been listening with exasperated but unsurprised sighs. Might he be put to work again? It’s not just Rabina’s campaign which has courted controversy. Peter Golds has been thoroughly enjoying himself but has been let down by a supporter who appeared on one of his leaflets. 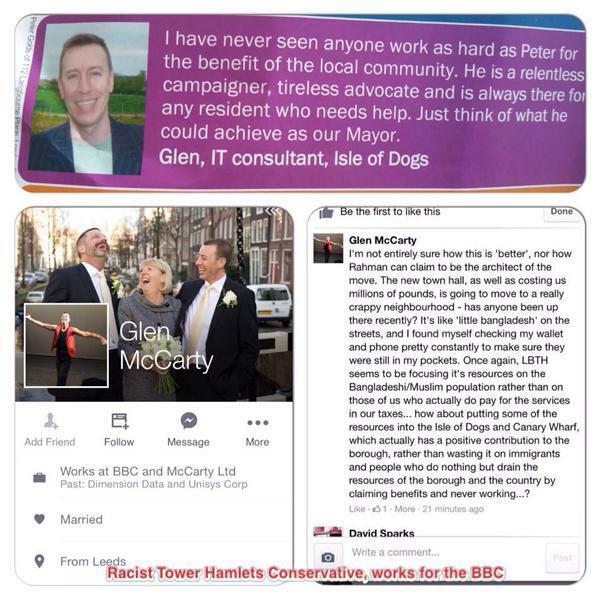 Rabina’s supporters have unearthed a Facebook posting by a Glen McCarty last year when he felt the need to vent some racist poison after apparently fearing for his wallet walking through Whitechapel. Here’s the posting and and leaflet. Perhaps he should have a word with Tory activists Ahmed Hussain and Dr Anwara Ali, who pays their taxes. Peter Golds says he’s appalled by it and has asked for an apology. If a Rabina supporter had written something equivalent there would be justifiable fury and that’s the case here as well. She has proved to be a crushing disappointment in this regard. She promised to be more accountable than her boss, Lutfur Rahman, to be more transparent, but she’s simply copied his tactics. This is, I suppose, not surprising when her campaign is being run and managed by Lutfur and his former advisers, including Mohamed Jubair of Channel S (remember his name, I think we’re going to hear a bit more about him soon, I reckon). She claims she’s going to be her own woman if she’s elected. She hasn’t demonstrated anything like that thus far. John Biggs has been successful getting out Labour’s big guns to campaign: Tessa Jowell has been a regular; Dan Jarvis came last night, Andy Burnham tonight. Less successful has been the party’s attempt getting out hordes of local activists and perhaps this is a reflection of rising rents in Tower Hamlets where there has traditionally been a flow of students to help at times like this. One final thought for now: Rabina has just been on BBC London radio boasting about her housing record. But during her time as cabinet member for housing, service charges for Tower Hamlets Homes leaseholders in my old patch of Bow have risen by 30%. A significant reason for this has been the costs dumped on Tower Hamlets Homes by the council for various management services and contracts. I’ve previously asked her about this, but guess what: no response.